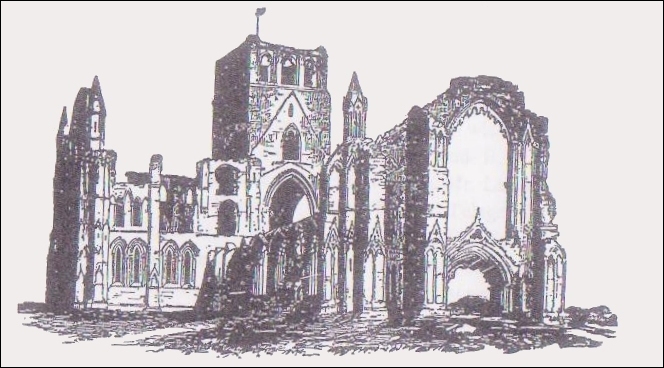 ...the story of the building of St. Hilda's Parish Church. Figure of St. Hilda, Priory Chapel, Sneaton Castle. Shortly before St. Hilda was born her father, who was a King, was poisoned by an enemy. The night before the birth her mother dreamt that she was wandering in a dark wood vainly looking for her husband. In her sorrow she clutched at the bosom of her dress and found there a great jewel. As it lay in the cardle of her hand, it began to glow with a soft light which increased in brilliance till it not only lit up the place where she was but shone out over the whole of England. It is to be wondered if the next day when she cradled her newly born babe in her arms, she realised that her dream would come true. Did she realise that the infant would grow into a woman whose life would be a light which would shine far and wide; and that the light of that life would shine (thirteen and a half centuries later) in the witness of a Christian community building a Church to her memory in Seymour Hill? Princess Hilda was adopted by King Edwin of Northumbria whose wife Ethelburgha was a Christian. When Hilda was thirteen years of age she and the King and the royal household were baptised by Bishop Paulinus, the Queen's Chaplain. In the crypt of York Minister to-day one can see the font which it is believed was used on that occasion. A pagan, King Penda from neighbouring Mercia, successfully attacked Northumbria and killed the King and established pagan rule. During his rule, Hilda clung to her desire to follow Christ and slowly she realised that God was calling her to a full time ministry. She was contemplating going to a religious house in France when Bishop Aidan, who was working to convert Northumbria to the faith once more, contacted her and asked her to return and work with him. Without question she obeted the call, and so the work for which her life so far had been a preparation, was begun. At first she was put in charge of a small group of women, then later a much larger and fully established house at Hartlepool, and finally she was called to Whitby where she had many under her care. The common folk and even Kinds and noblemen sought her help and advice. She fostered with care the poetic gift of one of her herdsmen, Caedmon, as a means bringing the knowledge of the gospel to the common people. Her community was only second to Lindisfarne in training young men for the ministry and five of her pupils became bishops. The light of the gospel foreshadowed in her mother's dream indeed spread abroad. For the last six years of Hilda's life she suffered great sickness, yet never failed to carry on her work and to be thankful to God. Near midnight on 17th November, in 680 at the age of 66 years she passed to her rest. The picture on the front cover of this booklet is from a photograph of the figure of St. Hilda in the Priory Chapel, Sneaton Castle, Whitby, kindly sent by the Prioress. St. Hilda holds in her right hand a pastoral staff, symbol of office of a bishop, abbot or abbess. The little Church which she holds in her left hand represents the Abbey she founded. As the parish church is consecrated let us pray that it may carry on the teaching tradition of St. Hilda and be used by God to bring all who worship within its walls, nearer to the One Who is the "true light which lighteth every man that cometh into the world" (John 1, v. 9). One event which is always associated with Hilda as the Synod of Whitby. Christianity came to Northumbria from Iona via the north and also from the Continent via the south. Where they met there was some confusion caused by different customs, the worst of which concerned the date of Easter. King Oswy was celebrating Easter whilst his wife was still fasting for Lent. In 664 the King called a synod to settle the disputes which were caused. The synod decided in favour of the Continental or Roman custom as it was for the strength of all that the smaller group should concede to the greater. In consequence Colman, who put the Celtic view, threatened to resign his bishopric, whilst Hilda, who sympathised with Colman and the custom to which she had been used, loyally accepted the decision of the Synod, setting an example of obedience and humility.